The entrance to your home and the area around your garden leave impressions with guests, neighbors, and those who drive by your home. Pavers or concrete can enhance the look of this area and make it stand out. 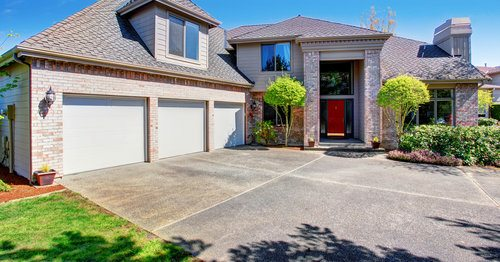 Whether you want to update your garden or completely redesign the look of your driveway, concrete and pavers are wonderful options. 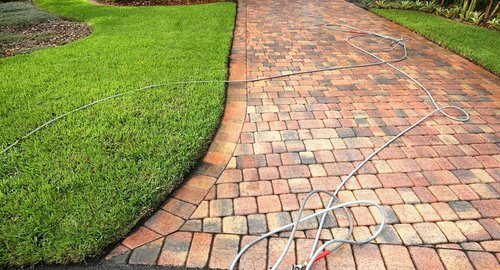 While pavers and concrete seem simple enough, the decision as to which one to choose is not always cut and dry. Below, we introduce you to the positive and negative of both to help you decide which one would be better for your home. Pavers are usually more visually appealing than concrete slabs 1 because you can manipulate the pavers and create designs, and they come in a variety of colors. While concrete is not as plentiful when it comes to designs and colors, you can choose stamped or decorative concrete, which provides a beautiful appearance. 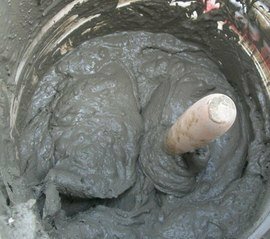 Poured concrete can have color added to it, but that color generally fades quickly and may not look as nice as it once did. If you have color added to your concrete, it will need to be reapplied every couple of years. Pavers are considered more difficult to install than concrete because a concrete slab is poured, whereas the pavers must be laid by hand individually. It is almost always recommended that you have a professional install both options. It is possible to complete a paver job as a DIY project if you plan to use the pavers around your landscape or in your garden, but larger surface areas should be done professionally. Concrete slabs are generally poured and then allowed to dry and cure, which can take a couple of days. Once the area is dry, it is ready to use. Typically, installation involves excavation, grading the land, and preparation of the foundation. Installation of pavers is a bit more detailed and requires proper planning, excavation, and grading. Once that is done, the pavers will be laid, and polymer sand or another type of adhesive-like material will be used to join the pavers. The cost to install pavers or a concrete slab depends on the surface area that you want covered, materials, labor, and removal of previous pavers or concrete. If you want pavers installed over 120 square feet of land, you are looking at a cost of $560 to $850 for the pavers. The cost for labor ranges from $640 to $775. Materials, such as mortar 2, binding materials, and polymer sand, range from $55 to $65. Equipment costs anywhere between $55 and $80. The total cost to install pavers for a 120-square foot area will cost between $1,310 and $1,770. If you pour a concrete slab over a 120-square foot area of land, you are looking at a cost of $210 to $250 for the concrete. Labor will cost between $540 and $650. Materials, such as reinforcement materials and cleaning supplies, range from $30 to $35. Equipment will cost an average of $85 to $150. 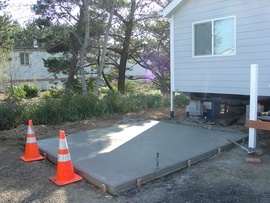 The total cost to install a concrete slab over 120 square feet will be between $865 and $1,085. Concrete is considered easy to maintain, but it does crack and stain with time, which will require replacement of the concrete slab. Stamped concrete is easy to maintain as well and only needs to be rinsed off and washed with dish soap and a scrub brush. It is possible to have protective sealants added to the concrete to help block stains, but this sealant needs to be reapplied regularly for it to continue working. Pavers are generally easy to clean, but not as easy as concrete since they are not a single slab. One of the biggest concerns with concrete and pavers is weeds, as they often grow in between cracks and the pavers. When pavers are placed, polymer sand is often used to help interlock the pavers, which provides more durability. The polymer sand is a granular material and is poured in between the cracks and crevices. Concrete slabs are more prone to splitting and cracking, especially if the ground beneath them shifts. In addition, changes in the temperature can affect the concrete slab and cause cracks as well. Pavers do not tend to crack, but they can loosen over time. When that happens, it can become a hazard, and you need to replace the individual paver. One of the nice things about pavers is that they are four times as strong as a typical concrete slab, which means they can handle four times as much weight on their surface before they crack. When it comes to durability, pavers tend to be more flexible, especially when a crack or problem does occur. You can replace individual pavers, whereas you must replace the entire concrete slab when a crack occurs. Concrete lasts for many years but is a bit more difficult to work with. Pavers are generally the go-to option when you want to decorate around your driveway or in your garden. Repairs are easy when it comes to pavers because you can tackle the repair on top or even under the paver in question. Generally, if a paver needs to be replaced, it can be without having to replace all of the other pavers or even those around it. Repairs to concrete are harder because when the concrete cracks or a repair underneath needs to be made, the concrete must be removed, and then a new slab laid. Concrete slabs can become slippery when wet, especially if they have been treated with a protective sealant or been painted. When the concrete is slippery, shoes cannot grip it, and falls can happen. Pavers do not have as much of an issue with slipperiness as does a concrete slab. This is because the pavers are individually placed, and you can choose pavers with raised edges to help improve grip. If you choose concrete pavers, you may run into the same problem, as they can become slippery when wet. Pavers have a higher resale value because of their beauty and versatility. Concrete slabs are generally more common, but over time, pavers will net you more value because concrete is expensive to replace. How much does it cost to install pavers or concrete in my city? Cost to install pavers or concrete varies greatly by region (and even by zip code). To get free estimates from local contractors, please indicate yours.